We all have self respect and we want it to be stronghold of our lives . Self Respects starts from ourselves first before it shines to others to see what kinda of creation are we and through that we earn respect, love, care and someone whom people like to be with. Many people look for it outside waiting for others to recognize it but usually others don't see it in us because of our attitude, character and the way we deal with people at large. Mohandas Gandhi is one person i usually take as my motivator . With his style of living, fighting for independence of India, humanity and humbleness, he is know as Mahatma..... His statue is erected even in London as a sign of respect to this earthly man. The white's have so much of respect for him even though they have persecuted him many many times. In the movie Ghandhi, even the judge stands up to respect this small build man. He was a man of dignity which the world will testify. His dignity after many many years and generations to come, will remember him as the MAN OF SELF RESPECT AND DIGNITY. That is what respect all about. Today how many of us have taken the pledge to be like this man, Gandhi. Do we have principals in our life's ? Let's ask ourselves first. I see many (including me) not sure where we stand in the first place. We think we know but the actual fact we don't know . Chitra Pronami was held in Teluk Intan on 17th and 18th April 2011. Mr Utayakumar and Mr. Jayathas was there to build the awareness to the people who came for the celebration. Our Tent was the biggest compared to Gerakan on our right and DAP / PAKATAN on our left. They are only quarter of our size . During the celebration MP's like YB Kulasegaran, YB Manoharan and YB Sivanesan was in the DAP tent distributing packed food and drinks. this MP's was there for about 2 to 3 hours max. after that they were all missing in action. As for Gerakan camp, I didn't see any MP's there at all. they too giving out drinks. As for HRP camp (tent) we have many posters and Video slides that hails about our struggles and fight against the government and the police force . We had big speakers facing the crowd and each time the voices of "Hapuskan Interlok" and Polis Kejam was heard loud and clear to all worshipers. We have even many visitors coming to our tent and asking questions about our quest for eradicate Indian's sufferings. 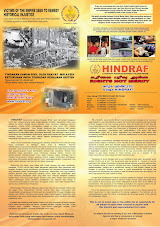 People in Teluk Intan would justify that HRP and Hindraf was one strong team as our Teluk Intan and Perak group work around the clock to make sure all is in order. Our Teluk Intan guys even served free Rabina too all worshipers . they chipped in from their own pockets to serve more then 2,000 people. To remind all of us , that the Teluk Intan group consist of 5 to 8 strong members only. I saw the Rabina bottle and it was about RM78 ringgit a bottle and they have a case full for this purpose. These simple guys from Teluk Intan have earned our respect especially from Mr Utaya and Mr Jayathas as they are just a normal working guys. They show us simplicity of love and care for Indian worshipers. They did all these not for self glory or to get praises but they did it for Indian's whom i can see burning in thier hearts and soul .... A simple sacrifice of this guys make them well respected by the community. This is what i meant of Respect earned and its builds self respect for themselves and us all to gather. i notice the joy of serving Indian's in their eyes. My heart and my salute goes to this young men from Teluk Intan . If we all want to learn about self respect then we should learn it from this young man's. Through self respect they found Dignity ... as Gandhi did. 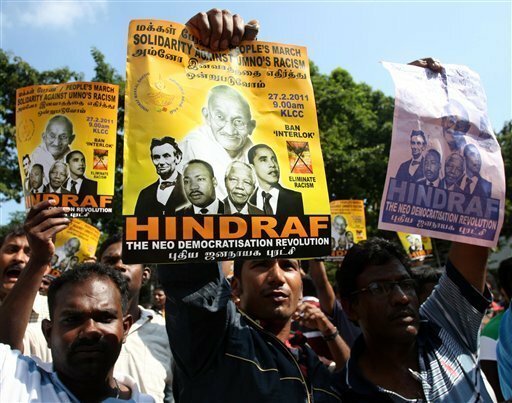 We today, are facing the same struggles as Indian's in Malaysia. Lets put our hands togather to support Human Right Party ( HRP ) leaders as we prepare ourselves for an uphill battle against racism against Indian's. Lets start helping and contributing to our Indian struggles. Nothing can be done without money as we all know that very well ... as some of our brothers who fought for us in the interlok issue still haven't come out with bail money. They did all this rallies and car convey for us Indians and our children, so aren't we too be responsible to help to raise the bail money for our brave HRP supporters . Lets not waste time, just donate a RM1, RM2 , RM 5. RM 10 or whatever amount we can afford to support our Indian brothers and supporters. RM 5. RM 10 will make us poorer . Be like the Chinese , when they are faced with a problem or issue , they will not hesitate to donate for a good cause whe involves a brother of them ..why can't we imitate them in doing the same.